Create isometric or other parallel projected illustrations for assembly and maintenance instructions by dynamically drawing on a projected plane. Project your existing planar objects to a desired plane instead of manually calculating the skew angle and rotation. Eliminate the need to draw and project dimension objects in multiple steps thanks to the advanced dimension tools. Display precise measurement values in build plans and more, including radial and diameter dimensioning. Plus, with projected dimension options, your projected drawings can be quickly documented with precise and dynamic dimension lines and text. Add context to your technical projects by using 3D views and models in your illustrations. With the integrated Lattice3D Studio, you can create high-quality renderings from 3D views imported from DWG, 3DS, VRML and XVL files, or use the unique Insert 3D functionality to embed 3D models as editable 3D elements with a high-resolution preview. Use the callout drawing tool in Corel DESIGNER to add interactive functionality to callout shapes in technical publications. With the Object Data Manager docker, you can list metadata fields, such as WebCGM metadata, for callout shapes. Object data items can be edited so that callout shapes can be manually edited as hotspots for WebCGM output. We've created our most powerful fill engine ever, giving you complete control over your fountain, bitmap pattern, vector pattern and hatch fills. Plus, the new Fill dialog includes access to Content Exchange and fill libraries in Corel DESIGNER. Create your illustrations and diagrams in accurate scale with the drawing scale control. View the active drawing scale, switch to another preset or set a custom scale at any time. In addition, Corel DESIGNER X7 maintains the drawing scale when importing a vector illustration from a 3D model view so that imported views can be placed at a precise scale. Apply a consistent look throughout your projects with Object Styles, Color Styles and Color Harmonies. The Object Styles docker centralizes style creation and management with everything you need in one place, including Outline, Fill, Hatches, Dimension, Callouts, Halos, Character, Text Frame and Color styles. Group your favorite styles together in Style Sets to format many objects at once. Ensure consistent styles, including externally referenced symbols, and layout throughout your design projects. With the enhanced Object Styles in Corel DESIGNER X7 and CorelDRAW X7, you can manage object styles, such as outline color, line style, line width, fill type and color, and text styles. You can then create symbol libraries that can be accessed and used across projects. Reuse the style definitions that you create once and apply to the individual components in the custom symbols. Manage mathematical equations as editable elements within technical illustrations using the newly integrated Equation Editor. Mathematical and scientific formulas can be inserted and displayed in the drawing, and then modified when needed. Existing equations from older CorelDRAW documents can be opened or imported for use in Corel DESIGNER equations. Create time-saving QR codes with Corel DESIGNER X7 and add scalable QR codes to a drawing*, allowing you to give technicians in the field the ability to link to online technical documentation from printed documentation or machine labels using a smartphone. The enhanced Color Styles docker makes it easier than ever to view, arrange, and edit color styles and harmonies. You can now specify the brightness value, and preserve saturation and hue while adjusting a color. New harmony rules let you snap all colors in a color harmony to a rule-based system, so you can modify those colors while preserving the color harmony. Keep up with current industry requirements with the ability to publish to a variety of industry-standard file formats, including WebCGM (with S1000D profile support) for Interactive Electronic Technical Manuals (IETM), Illustrated Parts Catalogs (IPC) creation, and PDF support, including ISO standard PDF/A and 3D PDF. Choose from more than 100 up-to-date vector graphics, bitmap image, document and other data file formats supported for import and export capabilities. Exchanging files is hassle free, thanks to expanded file formats support including .SVG, .CGM, .DWG and .DXF, .PDF, TIFF and Adobe CS/CC (AI, PSD). 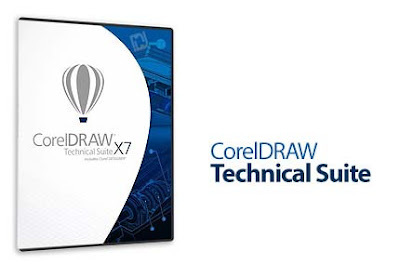 Enhance your natural design workflow with the new CorelDRAW X7. This powerful application offers superior vector illustration for graphics, page-layout tools and the ability to customize your user interface so you can get to work immediately. Explore the versatile and easy-to-use tools in Corel PHOTO-PAINT X7 to quickly and easily manipulate photos. This professional image-editing application provides state-of-the-art features for cutouts, retouching and enhancing photos for any type of technical communication project. The included Corel® Website Creator™† continues to make website design easy for everyone. With dozens of new templates and SiteStyles, enhanced support for CSS3 and new HTML5 capabilities, you can quickly design, build, and maintain interactive and eye-catching websites without learning how to code. Enjoy dramatically minimized wait times with true native 64-bit Windows 7 and Windows 8/8.1 applications, and enhanced multi-core processor support. The enhanced speed lets you quickly process large files and images. Plus, your system will be more responsive when running several applications simultaneously.